2. Make the honey glaze: In a large skillet, reduce the red wine over medium heat until there is only about ¼ cup liquid. Pour the wine into a medium bowl to cool. In the same skillet, bring the honey, garlic, dark brown sugar and barbecue sauce to a simmer. When it starts to foam and turn light brown, remove the skillet from the heat and pour in the apple cider vinegar. Return the skillet to the heat and allow it to simmer until it becomes like a light glaze, 12-15 minutes. Stir in the black pepper and scallions and pour it over the red wine in the bowl. Whisk to blend. Taste for seasoning. 3. Prepare and cook the chicken wings: Cut each chicken wing at each joint so each wing is cut into 3 parts. You will have 36 pieces including the wing tips. Season them with salt. In a small saucepan, melt the butter and stir in the paprika. Put the wings on a sheet pan and brush them with the melted butter mixture. Bake them for 30 minutes. Turn them on their second side and brush with the remaining butter mixture. Return wings to oven and cook another 30 minutes or until fully cooked. 4. 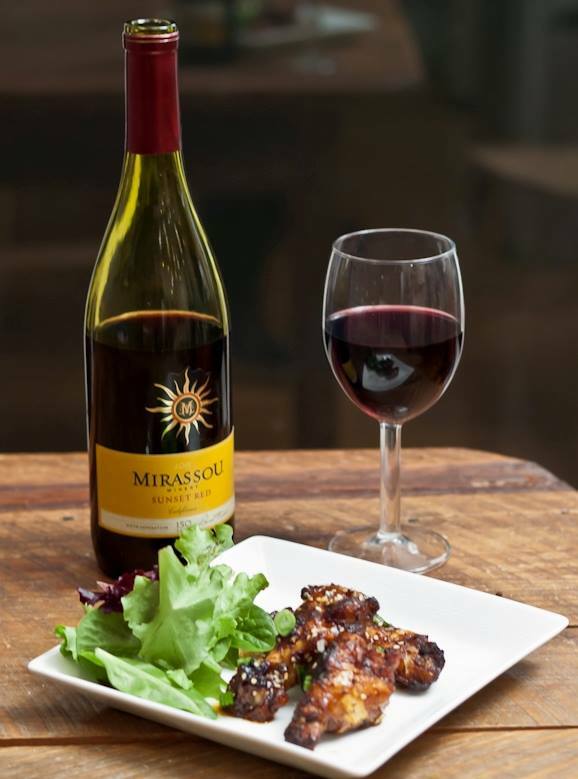 Finish the wings: Toss the cooked chicken wings in the honey red wine glaze and squeeze the lemon juice over them. Serve.